Protarchaeopteryx was an ominovorous (or possibly herbivorous) dinosaur that lived in the early Cretaceous period, about 125 million years ago in China. Protarchaeopteryx had symettrical feathers on its arms - modern birds with symettrical arm feathers are incapable of flight. Protarchaeopteryx's skeletal structure seems to have been unsuitable for flapping flight. Asian Dinosaurs - Protarchaeopteryx lived in China. Protarchaeopteryx was a genus of dinosaur. "Protarchaeopteryx" means "before Archaeopteryx - "Archaeopteryx" refers to one of the earliest known birds, and its name means "ancient wing", thus "Protarchaeopteryx" can be translated as "before ancient wing" or "early ancient wing". Protarchaeopteryx was a member of the Saurischia ("lizard-hipped") order of dinosaurs. What this means, is that although Protarchaeopteryx was not closely related to lizards, it did have similarly shaped pelvic bones. 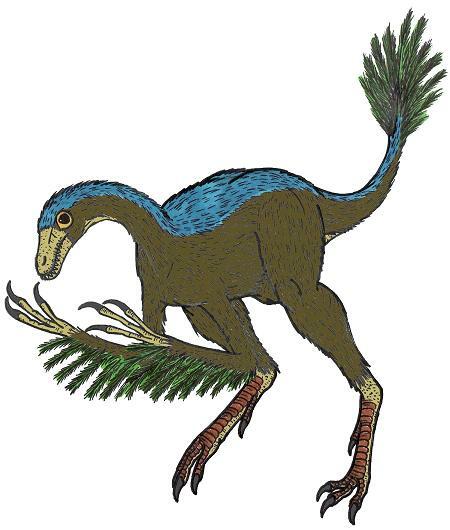 Protarchaeopteryx was a Theropod - a member of a group of related bipedal dinosaurs that included the ancestors of birds (although Protarchaeopteryx was not itself an ancestor of birds). Protarchaeopteryx lived about 125 million years ago, during the Cretaceous period. Protarchaeopteryx was a omnivore (ate both meat and plants). Protarchaeopteryx was upto 6½ feet (2 meters) long.